Yelawolf Tre Flips at Tompkins from RB Umali on Vimeo. 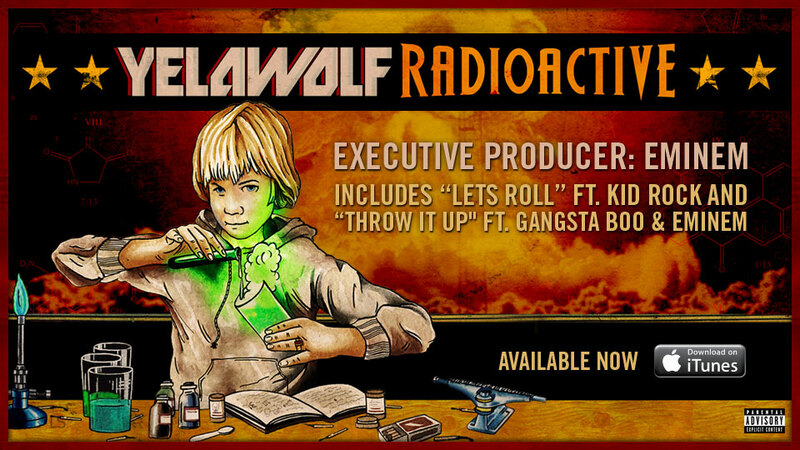 Radioactive is the debut studio album by rapper Yelawolf, released on November 21, 2011 through Shady Records, and Interscope Records. Yelawolf has had an unconventional rise to stardom. After purchasing his first car, he traveled to the Bay Area to pursue professional skateboarding. Spending a lot of his time in Berkeley, he would often spend nights at abandoned frat houses while eating at Food Not Bombs because he was too broke. Yelawolf sets himself apart by breaking down any barrier that puts a limit on words spoken per second. His lyrics are honest and his swagger is Southern, that is to say, sophisticatedly crunk. Yelawolf is the face of contemporary Southern hip-hop. At least this is the impression we got off his 2010 mixtape Trunk Muzik. When The Source is giving an album 4.5 of 5 mics, it makes us think that there is something behind this. Radioactive is actually one of the most anticipated albums of the year. During an interview, Yelawolf revealed that almost all the tracks of the album were recorded in Las Vegas, Nevada. The final track of the album is described as very personal about Yelawolf's life, and it's supposed to be a very emotional final letter to his absent biological father and talks about other past struggles. The track is titled "The Last Song". The album was scheduled to be released in September 27, later was pushed back to October 25, in early October Interscope Records announced that the album has been released today, on November 21.